What do you want to accomplish with your social media marketing? Well, successful social media marketing starts with setting goals and metrics — and they have to be SMART goals. I see too many small business owners just diving into social media marketing without planning anything. You can’t have a plan without goals! How do you know what you’re doing is working? Jumping in without goals is a useless effort — you waste valuable time and money. 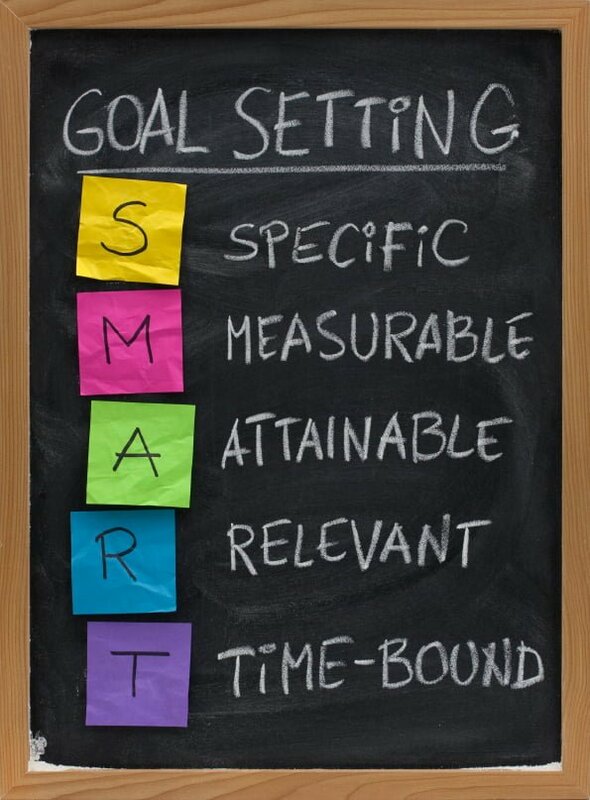 Let’s break down SMART goals. First of all, it has to be Specific: “Getting more sales” or “building awareness” is not specific. That’s very general. Sure you want more sales. Who doesn’t? The best way to get specific on this is to determine how many new clients or customers a month you need to make a profit each month. Start with how much money you want to make in the next 12 months, fiscal year, or calendar year. Divide that by 12 or however many months are left in the calendar year and that becomes a specific monetary goal that you want meet every month. Now, how many new clients do you need to reach that goal? A SMART goal could be: 5 new clients every month. The question then is HOW are you going to get them? That’s where strategizing comes in.Next you need to determine how many new visitors you need to come to your site in order to convert them into those 5 new clients. Begin with how many visitors you are currently getting. Hopefully, you’ve got some sort of analytics setup on your site like WordPress’s JetPack or Google Analytics. Both are free, but they won’t help you until they are setup. Hence, if you’re just starting out, you’re not going to have anything to go by. Set a sensible, realistic attainable goal for website visits. If you surpass it, excellent! Raise the bar a little higher for the next month. If you don’t meet your goal, you’ve got to review what’s not working and change your strategy and tactics.Then determine the conversion rate. Depending on your site, company, product or service, the conversion rate can be anywhere from .1% to 10%. To reach the goal of 5 new clients, you need 100 visitors to your site in one month at a 5% conversion rate. If you don’t get that at the end of the month, you have to ask yourself, “What did I do wrong?” or “What didn’t I do?” You may be able to find out what your industry’s standard conversion rate is by doing some research on Google. Measurable: At the end of the month you can look at your finances and analytics and see if you’ve met the goals. Consequently, you can adjust your strategic and tactical plans accordingly. Attainable: A 5% conversion rate is not that easy to attain. A more realistic one would be 1% for the first month — especially if you’re just starting out. You’re going to have to blog 3 times a week to draw people to your site. You’re going to need to post to social media several times a day to be effective in building awareness and SEO. Relevant: If you’re more B2B than B2C, having 100 followers on Instagram is not really relevant. That goal, however, is relevant on LinkedIn. However, the reverse would apply to a B2C company trying to reach consumers with a product or service. Time-Bound: I like using the monthly time frame. It’s manageable and gives you time to develop the strategy and tactics that you’re going to use to meet them. It’s also convenient to look at your analytics and insights when you’re doing your end-of-the month bookkeeping. Saying you want 100 followers on Twitter in 1 week is not attainable. I’ve done it in 2 weeks for a client, and it took a lot of diligent posting, understanding the target market niche well, researching keywords and creating the right hashtags. Twitter analytics told me a lot about their followers and the other topics they are interested in, which helped me determine what content to post. Sure you’re going to have overall goals and objectives as well as long-term goals, but for successful social media marketing, go month-to-month. This makes it easier to plan ahead to the next month and you only have to deal with one month at a time. Now, if your business depends on holiday or seasonal business, you may need to do a 3-6 month plan, but have monthly strategies and tactics planned out. Goals become real when you’ve got them written down somewhere. Whether it’s a Word document, a whiteboard, an app, software program, bulletin board or Post-it notes — whatever works for you. What are some successful social media marketing metrics? What are your KPIs (Key Performance Indicators)? Target market demographics – if you’re local, you need to make sure that a high percentage your following is local! Next > Next post: Social Media & Your Website – Don’t Make Me Hunt!